Explore some of the most famous buildings and monuments of Agra on this Agra day trip. Agra is popularly famous for the Taj Mahal, but there are other things which are also popular in Agra. Shopping streets, leatherware, stone inlay work, food walk are some of them. There are other plenty of activities you can do on this Agra day trip. 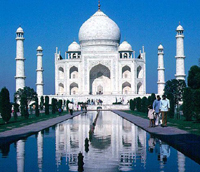 Visit the Taj Mahal in this Agra day trip, the UNESCO World Heritage Site and one of the 7 wonders of the world. Learn about the history and story of how and why Shah Jahan built this great monument in the memory of his beloved wife Mumtaz Mahal. Another UNESCO World Heritage Site in Agra is Agra Fort. This red sandstone monument was built by Mughal Emperor Akbar the great in 1573. It lost much of its grandeur after the death of Akbar in 1666. It was repetitively invaded and captured in the 18th century until Britishers finally captured it in 1803. Many of its buildings have been destroyed but some mosques, public and private audience halls, palaces, towers and courtyards still remain. Apart from these two main monuments, you can also visit two other impressive Islamic-style architecture buildings i.e. Akbar's Tomb and Itimad-Ud-Daulah. The grave of Akbar who was one of the most influential Mughal Emperor is present here. Itimad-Ud-Daulah was the first building made of white marble. The other monuments were built of red sandstone architecture. One of the must-visit place in Agra in Sheroes Hangout (She+Heroes). This place is completely run by women who are survivors of the acid attack in India. It was founded in 2014 by a Delhi-based NGO with the idea to raise awareness towards this dreadful issue and give women the confidence to show their faces in public after being disfigured. The hangout surely serves the tasty food and beverages, a library (you can eat while reading) and an exhibition space. The Mehtab Bagh or the Moonlight Garden is the best way to witness the beauty of the Taj Mahal across the river. The garden is in 25 acres of land and sits opposite the monument. It was built by Emperor Babur ( the founder of Mughal Empire) and fell into ruins. But now it is one of the best places to witness the beauty of stunning Taj Mahal during sunset. Experience the romantic view of the greatest symbol of love from this place and capture the lifetime memorable moments. Head to the congested Old City behind the Jama Masjid to experience the heart of Agra. Roam around the narrow lanes housing a variety of spices, clothes, saris, jewellery, shoes, crafts and snack stalls. The area, i.e. Kinari Bazaar can be overwhelming for new tourists, hence it is better to take a guided walking tour. Kaimur Holidays also offers walking tours with guides where you can experience the daily life of Indians closely. Explore an authentic Agra Homestay run by a family in Agra with bed and breakfast. Situated away from the usual chaos that defines our country. In this private Taj Mahal-Agra Fort Sunrise tour, witness the beauty of Taj Mahal during sunrise and visit one of the most romantic monuments of the World. Agra is famously known for the Taj Mahal, but Agra's local food and delicacies are not very known. This walking Agra food tour is an excellent.